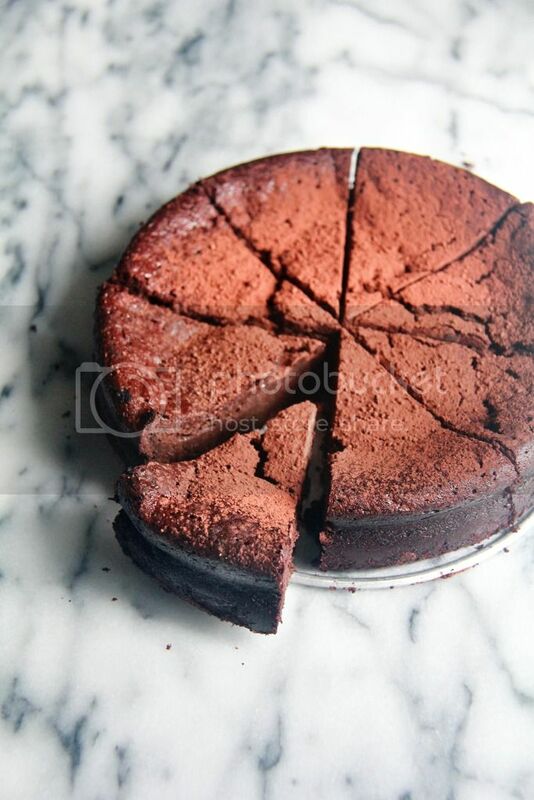 Crumbs and Cookies: michael rostang's double chocolate mousse cake. 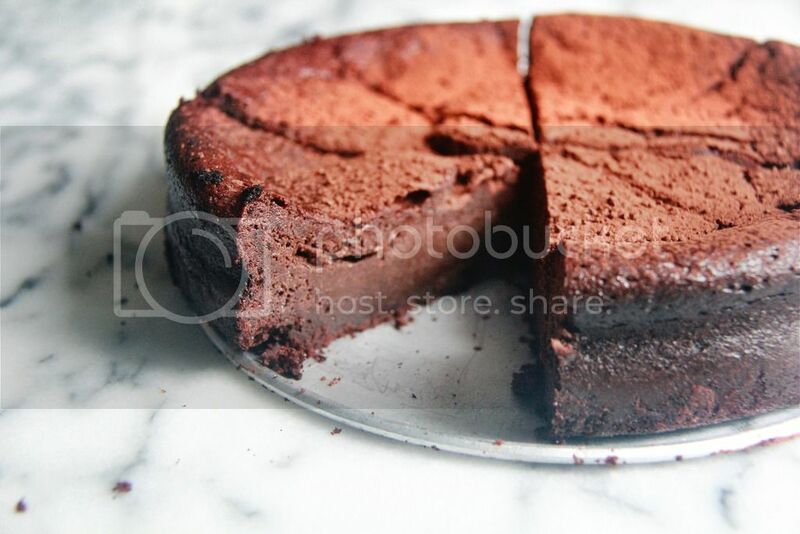 Does this cake look like a giant round of chocolate truffle or what? Sorry just had to get that out of my mind and out of the way. This cake is kind of like a fallen chocolate souffle cake except that it has two stages and three ways you can bake it. The common step to all three variations is to bake a thin layer of batter which will serve as a base. 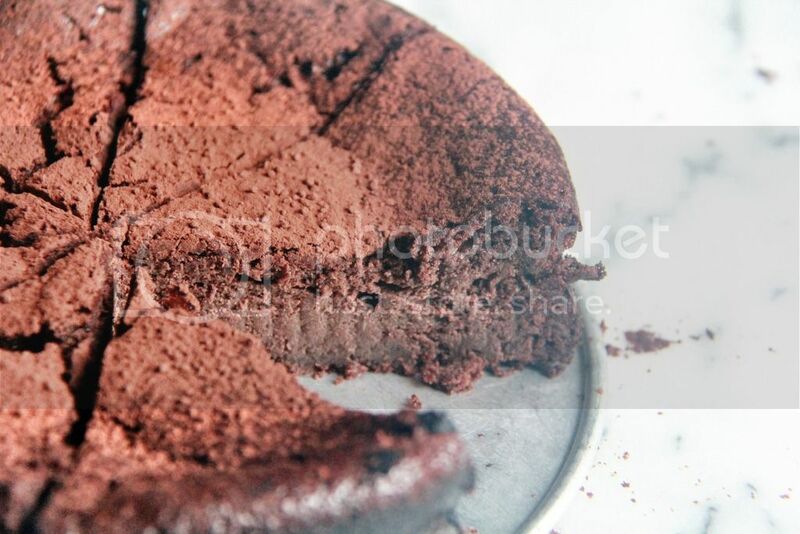 After letting the base cool, you can choose to pour the remaining batter (which is essentially chocolate mousse) onto the cake, chill the whole thing and eat it when it's firm. Or, you can chill the base, pour the remaining batter on top of the cold layer of cake and bake it again. You can serve this cake warm or put it back into the fridge to chill again. You will have to decide which variation you would want to go with based on your preferred cake texture. I went with the baked and chilled version because Dorie recommended it. I made a few errors along the way because my mind was still foggy with sleep - it probably wouldn't have mattered which time of the day I had baked because the overcast sky and deliciously cool weather that lasted a whole day would have trapped me in a trance the entire time anyway. I don't think I managed to achieve the texture I was supposed to produce in the cake but I can roughly see how the cake was meant to turn out - the base is supposed to be distinctly denser than the top layer, which while firm after baking and chilling, manages to retain a fluffy airy quality that literally melts in your mouth. 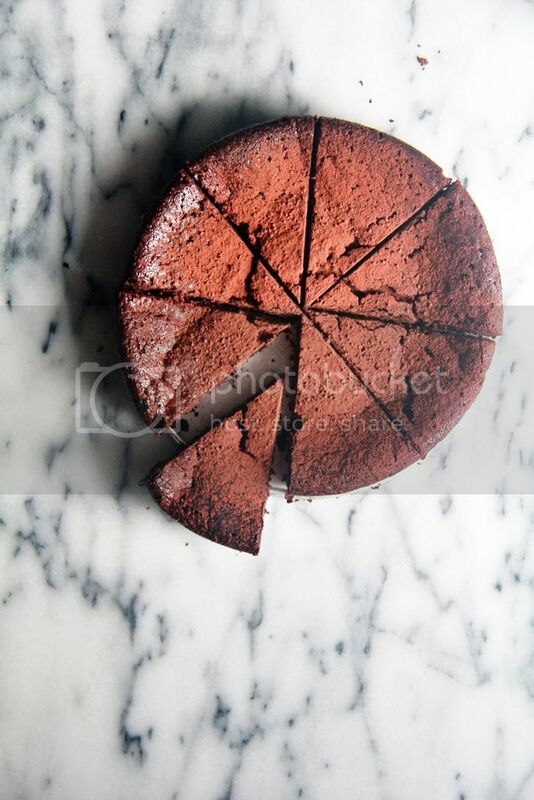 The recipe specified to bake the cake in an 8 inch pan but I used a 7 inch instead because I found through other bloggers who have attempted this recipe that the cake turns out rather flat in an 8 inch. I prefer some height in my cakes - makes photo-taking a hella lot easier too! - even if they are rich and are best served in small quantities. P.S. I finally have a Pinterest account! I have a board dedicated to my bakes of course, and a bunch of others for inspiration. You'll probably be able to guess what I might be baking next based on my pins. There's not a lot of content up yet but I hope you'll join me there! 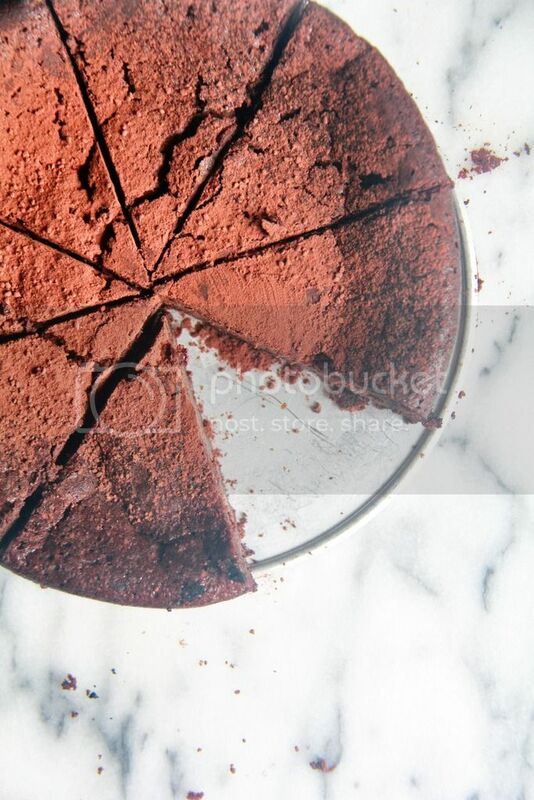 There are 3 ways you can serve this cake: warm, chilled or baked and chilled. The instructions below are for the baked and chilled version. Preheat oven to 400F. Butter the sides of an 8 inch springform pan and place it on a baking sheet lined with a silicone baking mat. Melt the chocolate in a bowl placed over a pot of simmering water. When it's smooth, whisk in the espresso or coffee. Remove pan from heat and stir in the butter tablespoon by tablespoon. Gently whisk in sugar and a pinch of salt, then add the yolks one at a time. Whisk the egg whites with a pinch of salt until they are firm but still glossy. Whisk about 1/4 of the beaten whites into the chocolate mixture to lighten. Fold in the remaining whites into the chocolate mixture. Scrape a generous one third of the mixture into the buttered ring of the pan. Cover and refrigerate remaining mousse. Bake the cake for 15 minutes. Transfer baking sheet to a cooling rack and let the cake cool to room temperature. Chill the base, still on the baking sheet, for at least an hour. Scrape the chilled mousse onto the chilled base, still on the baking sheet, and bake for about 30 minutes or until the top is puffed and dry. Cool cake to room temperature and chill for at least 4 hours. 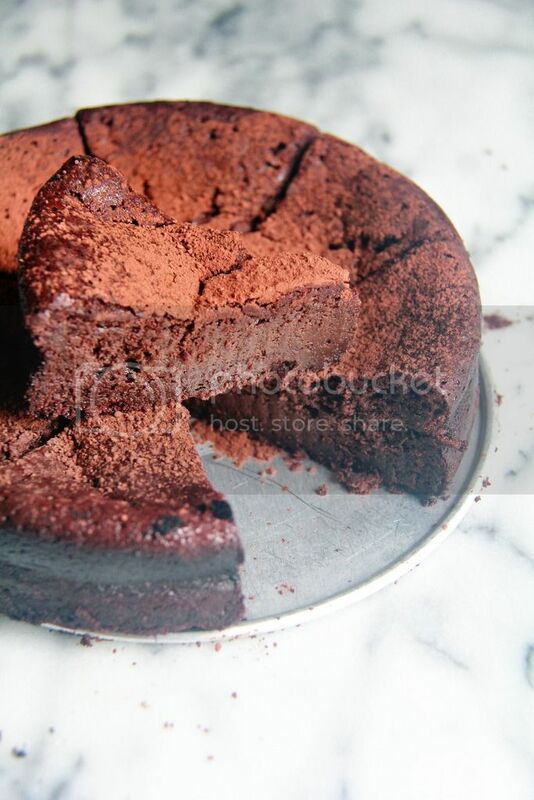 Dust the top of the cake with cocoa powder before serving. That is such an awesome idea to bake it twice! Definitely going to try this...i usually just bake the entire batter at once. This looks incredible. It's officially on my "must try" list.